The bolt that jammed during a spacewalk last week, preventing the attachment of a replacement power switching unit on the space station's main solar array truss, likely was damaged slightly during the device's installation, before the truss segment was launched in 2002, the station program manager said Wednesday. Astronauts Sunita Williams and Akihiko Hoshide successfully installed the replacement main bus switching unit during a spacewalk Wednesday after cleaning the bolt in question, removing metal shavings from its threaded receptacle and driving a spare bolt into and out of the fixture. The astronauts said they could feel an area near the top of the threads where the bolt tended to bind. 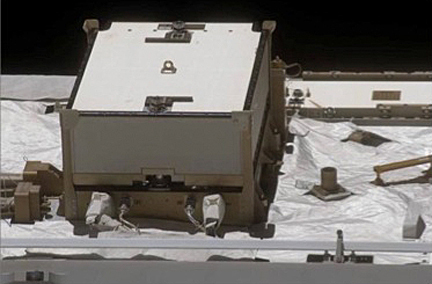 Space station Program Manager Mike Suffredini said a review of the truss's assembly and interviews with workers who actually carried out the original MBSU installation in the S0 truss segment indicated the problem likely was caused by galling, in which fasteners can "weld" together because of heat and friction. "This doesn't have to do with how long it's been on orbit," Suffredini said. "It really has to do with when we installed it. When we installed these particular MBSUs, and this one in particular because of the face of the truss it's on, we weren't able to rotate the S0 truss. So the ground crews had to get on a scissor jack (lift), they lifted it up high as they can, it's a 220-pound (unit), and they're ... facing up and they're trying to get it up here and then they're trying to torque it and wiggle it and torque it. "So we're not completely surprised that the threads could be a little gummed up," he said. "You can't cross thread (the) bolt, but we think we galled the bolt, which is not an uncommon thing to have happen if you put off-center torque on it when you're trying to torque the bolt down." He said engineers will assess other components installed in the same fashion to determine which ones might present problems down the road. "But this isn't an age issue," he said. "This just has to do with the way we had to install them on the ground." Astronauts Sunita Williams and Akihiko Hoshide began repressurizing the space station's Quest airlock at 1:34 p.m. EDT (GMT-4), officially ending a six-hour 28-minute spacewalk to re-install a power distribution box on the lab's main equipment truss. This was the 165th spacewalk devoted to station assembly and maintenance since construction began in 1998, the fourth so far this year, the sixth for Williams and the second for Hoshide. Williams now holds the record for EVA time by a female astronaut, logging 44 hours and two minutes outside the station during her six excursions, moving her up to 13th on the list of most experienced spacewalkers. Hoshide, the third Japanese astronaut to walk in space, has now logged 14 hours and 45 minutes of EVA time during two outings with Williams. Overall, 109 astronauts, cosmonauts and international crew members have now logged 1,042 hours and 23 minutes -- 43.4 days -- of station spacewalk time since assembly began. An updated story will be posted after an upcoming news briefing by NASA mission managers. At 12:07 p.m. EDT, five hours into a dramatic spacewalk, flight controllers at the Johnson Space Center in Houston successfully activated a replacement main bus switching unit, completing a tricky repair job by astronauts Sunita Williams and Akihiko Hoshide. "We just cleared a caution that's been on the board for months," astronaut Jack Fischer radioed from mission control. "Looks like you fixed the station. Good job, you guys. It's been like living on the set of Apollo 13 for the past few days. NASA does impossible pretty darn well. So congratulations to the whole team." "Congratulations to all the folks who've worked on this, it's unbelievable," Williams replied from space. "Thank you very much for making us look good today." 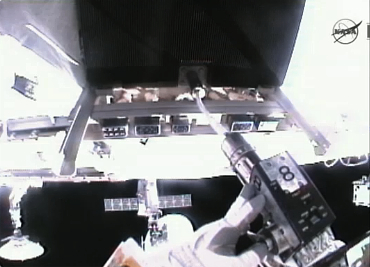 With the main bus switching unit back in action, once again routing power from two of the station's eight solar arrays into the lab's myriad systems, Williams and Hoshide pressed ahead with work to replace a camera on the station's robot arm. It appears unlikely they'll have time for any additional "get-ahead" tasks. After using MacGyver-like tools to clean and lubricate a sticky bolt and its threaded receptacle, astronauts Sunita Williams and Akihiko Hoshide successfully re-installed a critical power distribution box on the space station's solar array truss Wednesday, easing concerns about powerdowns and reduced science. "OK ... everyone on the ground, great job," Hoshide reported as he finished manually driving the bolt home. "The MBSU is locked." "All right buddy, that is a little slice of awesome pie," astronaut Jack Fischer replied from mission control in Houston. The successful installation came six days after bolt problems prevented the spacewalkers from installing the 220-pound main bus switching unit last Thursday in an aborted bid to replace a faulty box that was no longer responding to commands. With the replacement MBSU now in place, power from two of the station's eight solar arrays can once again feed into the lab's electrical grid, boosting power to near-normal levels. One solar array remains off line because of an unrelated problem in another part of the electrical system. That issue will be dealt with in a future spacewalk. The replacement MBSU was left partially installed and electricallly disconnected after last week's unsuccessful spacewalk. Metal shavings were seen in the bolt receptacle during the initial installation attempt and over the weekend, the astronauts assembled homemade tools designed to clean and lubricate the hardware. To do that, they first had to remove the MBSU from the housing where it was partiallly bolted down. Hoshide had problems loosening the H2 bolt holding it in place, but they finally succeeded and the box was temporarily mounted on a holding fixture. Hoshide then used a pipe cleaner-like bristle tool to remove shavings from the bolt receptacle, followed by a toothbrush attached to a metal rod. Compressed nitrogen then was sprayed into the receptacle in an additional attempt to drive out any debris that might be causing the bolt to bind. Williams and Hoshide then drove a spare bolt into and back out of the H2 receptacle to get a feel for how difficult it might be to drive the actual MBSU bolt in. They reporting binding near the top of the bolt's travel, but they were able to manually drive it all the way in and back out. That cleared the way for an attempt to bolt the MBSU in place. And this time around, despite a bit of binding and increased friction, they were able to drive the H2 bolt all the way in, pulling the box down onto gangs of electrical connectors and cooling fins. "I see the whole thing is starting to move down as the bolt is doing it's thing," Williams said, gently rocking the box from side to side while Hoshide tightened the H2 bolt. "Keep that guy straight." "Seven turns," Hoshide said. "Eight turns, and I see the (lock) indicator in the middle. I have not encountered any unusual friction yet." "My left hand just fell asleep because my fingers were crossed too long," Fischer radioed from Houston. "We're holding our breath. Good job." "It looks like it's going down evening," Williams reported. "Not much room to dither at all." "Ten turns," Hoshide said a moment later. "Eleven turns. ... At 12 turns, a little increase in friction, but still OK with the ratchet." "That's to be expected, Aki," Fischer said. "You're just getting on the electrical connectors, so that's to be expected." A few moments later, Hoshide finished torquing the H2 bolt down. With the MBSU in place, the astronauts turned their attention to a so-called "get-ahead" item and prepared to replace a camera on the station's robot arm. After cleaning debris from a threaded bolt receptacle with a homemade bristle tool, a toothbrush and jets of compressed nitrogen, spacewalker Akihiko Hoshide manually drove a spare bolt into the socket to make sure there were no obstructions before attempting to remount a replacement electrical switching unit on the space station's power truss. He reported increasing friction after about three turns, indicating the binding that blocked installation during a spacewalk last Thursday was still present. "Basically, it's not going anywhere past three and a half turns," Hoshide reported. He and Sunita Williams then used a wrench with a longer handle to manually torque the spare bolt, repeatedly driving it in, then back out slightly, then back in again to get the threads smoothly engaged. The bolt then started turning. "It's a little hard, but it's not excessive," Williams reported. They were able to drive the bolt all the way in, but ran into similar friction problems when driving it back out again. The astronauts lubricated the spare bolt and drove it in about five turns in an attempt to reduce the binding. Again, the bolt hung up, requiring additional force to turn it past about four turns. Flight controllers then decided to have them back out the spare bolt and attempt to re-install the main bus switching unit. But the astronauts were approaching a four-hour time limit and pressing ahead would mean the spacewalk likely would run longer than the planned six-and-a-half hours. "We are approaching four hours," astronaut Jack Fischer radioed from Houston. "What we would like to do since we are making forward progress ... we would like to press with the install, but it's going to be up to you. ... You'll be fighting these same torques and then if it doesn't work, we'll be taking it back to the airlock. That's going to be a little bit longer than six and a half. How are you guys feeling right now, and do you think we can press with that plan?" "I think we can press," Hoshide said. "Let's get it done," Hoshide said. Earlier, the astronauts used a homemade bristle tool attached to a power driver to scour the interior of the H2 bolt housing of any debris that might be causing an attachment bolt to bind. "I already see a lot of metal shavings coming off," Hoshide reported as he began driving the bristle tool into the threaded receptacle. As he pulled it back out, he added "I see a lot of metal shavings coming out." He then repeated the procedure, slowly driving the bristles in and then back out again. "I still see a lot of metal shavings coming out," he said. Fischer told him to repeat the procedure yet again to get the bolt hole as clean as possible before another attempt to lock the main bus switching unit into place. Assisted by Williams, Hoshide then used a small can of pressurized nitrogen to blow any remaining shavings out of the receptacle. Again, he reported seeing a fair amount of debris coming out of the bolt hole. He was told to use another can of nitrogen in hopes of blowing out whatever might still be present. "I think we got all the metal shavings out," Hoshide reported. "We had a couple of big ones, but I think everything is out." 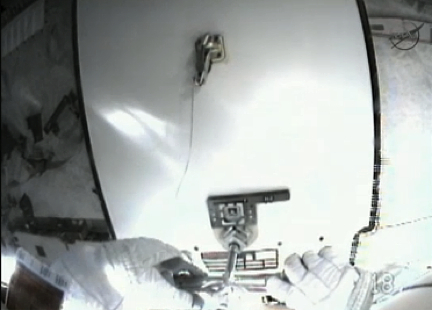 The spacewalkers then used a toothbrush attached to the end of a metal rod to continue cleaning the receptacles. They also lubricated the bolts and bolt housings to reduce friction when the bolts were driven back in. With their clearing work complete, the astronauts prepared to make another attempt to bolt the main bus switching unit into place. After struggling to loosen a jammed bolt holding a replacement electrical switching unit in place on the space station's solar array truss, Akihiko Hoshide and Sunita Williams finally succeeded in driving the recalcitrant bolt out, freeing the 220-pound box from its housing for additional troubleshooting. With Williams rocking the 220-box from side to side to ease any pressure that might be contributing to the problem, Hoshide, anchored to the end of the station's robot arm, used a power tool to turn the stuck bolt. But their initial attempts were unsuccessful, raising the prospect of a more serious jam. Flight controllers were on the verge of approving a higher torque setting, but warned "there's a possibility of breaking the bolt at that point." "You guys are the eyes on the scene, you know what's working and what's not, and I think continuing doing what you're doing and continuing to talk and figure this out is the best mode," astronaut Jack Fischer radioed from mission control. "So you guys have the call." Hoshide and Williams then made a final series of wiggles and bolt drives at the original torque setting, finally succeeding in freeing the bolt and backing it out. "It's rotating, counterclockwise. I feel a little bit of friction, but..."
"Yeah, nothing like it was," Williams said. The main bus switching unit is designed to be secured with two bolts, known as H1 and H2. As the first bolt -- H2 -- is driven in, it pulls the box down onto a cold plate, automatically engaging gangs of electrical connectors and cooling fins. During an attempt to install the replacement MBSU last Thursday, Hoshide was unable to drive the H2 bolt in far enough to lock the box to its connectors and cold plate. With the box now free of its housing, the astronauts inspected the bottom of the main bus switching unit to see if there were any obstructions interfering with the box's travel. Nothing obvious was seen. But Williams reported a small amount of metal shavings in the H2 bolt receptacle, similar to what she saw during the spacewalk Thursday. Two hours into the spacewalk, Williams and Hoshide waited for a daylight pass to begin cleaning and lubricating the bolts and their receptacles, standing by with compressed nitrogen and a set of homemade tools. A few minutes later, as the space station sailed back into sunlight over the Pacific Ocean, Williams, making her sixth EVA, moved past astronaut Peggy Whitson to become the world's most experienced female spacewalker, breaking Whitson's record of 39 hours and 46 minutes. "I have message direct from Peggy," Fischer called from Houston. "It says, 'Suni, congratulations on being the female world record holder of the most EVA time. It's an honor to hand off the record to someone as talented as you.' And then she ended it with 'you go, girl.'" "Well thanks," Williams replied. "Like I said before, it's a matter of circumstance, time and place. Anybody could be in these big boots." "Copy the boots," Fischer said. Floating in the Quest airlock module, astronauts Sunita Williams and Hoshide Akihiko switched their spacesuits to battery power at 7:06 a.m. EDT (GMT-4) to officially begin a planned six-and-a-half-hour spacewalk to make a second attempt to install a replacement power switching unit. Without the device, electricity from two of the station's eight solar arrays cannot be utilized, a shortfall that, left uncorrected, would have a major impact on station operations. Equipped with a set of MacGyver-like homemade tools, including a toothbrush attached to the end of a metal rod, the astronauts will attempt to clean and lubricate balky bolts that jammed during a spacewalk last Thursday, preventing them from attaching the replacement main bus switching unit. For identification Williams, call sign EV-1, is wearing a spacesuit with red stripes while Hoshide, call sign EV-2, is wearing an unmarked suit. This will be the sixth spacewalk for Williams, the second for Hoshide and the fourth for station astronauts so far this year. After last Thursday's marathon eight-hour 17-minute spacewalk, Williams moved up to 24th on the list of most experienced spacewalkers with 37 hours and 34 minutes of EVA time. Two hours and 12 minutes into today's excursion, she will move past Peggy Whitson as the world's most experienced female spacewalker. The 220-pound main bus switching unit, or MBSU, is one of four used to route 160-volt power from the space station's eight huge solar array wings to transformers that distribute 120-volt power to the lab's myriad systems. MBSU No. 1 suffered an internal failure of some sort several months ago and while it still delivered power, it could no longer be commanded. As a result, Williams and Hoshide removed MBSU No. 1 during a spacewalk last Thursday, but they were unable to bolt a replacement into its enclosure on the forward face of the station's main solar array truss. One of the two bolts in question, used to pull the box down onto cable connectors and interlocking cooling fins, jammed for some reason well before the box could be tightened down. Williams reported seeing metal shavings in the bolt housing when the faulty MBSU was removed. She attempted to blow the debris out with compressed nitrogen, but the astronauts still were unable to bolt the replacement MBSU in place. Rather than risk stripping the threads or shearing the bolt off with the power tool used to drive it, the astronauts were told to leave the box in place, partially installed and tethered to the truss, while engineers at the Johnson Space Center in Houston debated various repair options. The unsuccessful spacewalk ran eight hours and 17 minutes, the third longest in NASA history. Working through the Labor Day weekend, engineers radioed up instructions for homemade tools that Williams and Hoshide will use during their second spacewalk to more thoroughly clean and lubricate the bolt hole and threads. A spare bolt will be driven into the housing to help clean its threads and a toothbrush attached to the end of a metal rod will be used to clean the threads on the MBSU bolt. The astronauts will take special care to align the box before driving the bolts to ensure cooling fins and connectors engage properly. The timeline allows four hours for the replacement work. 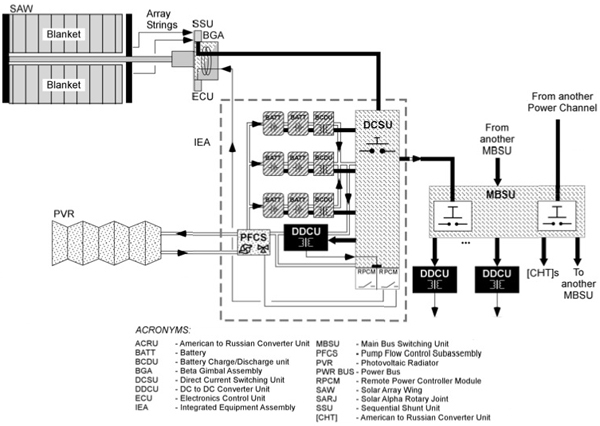 If the MBSU is not plugged back into the station's electrical grid by then, Williams and Hoshide will bring it back to the airlock for additional troubleshooting inside the space station. In that case, engineers would work on possible techniques for jury rigging electrical connections and cooling to get around the bolt problem. With MBSU No. 1 out of action, the station cannot tap into the power produced by two of the lab's eight solar arrays. In an unrelated issue, a direct current switching unit, one of eight used to route array power downstream to the MBSUs, tripped off Saturday afternoon, taking a third array out of the power grid. The DCSU issue likely will be dealt with during yet another spacewalk. The station's six-member crew is not in danger because of the electrical outage. But the loss of power, if left uncorrected, would quickly have a major impact on station operations, including robot arm work and research.